Jerome Robinson, Clippers – Robinson was the 13th pick and one of two Clippers lottery picks. He played just 33 games (0 starts), averaging under 10 minutes per game and 3.4 points per game. Robinson is buried on the depth chart. Troy Brown Jr, Wizards – Despite all the turbulence in Washington and the losses of Dwight Howard and John Wall to injury and the trade of Kelly Oubre, Brown averaged 7 minutes per game through the All Star break. He did get more playing time in the second half, bumping his season average up to 14 mpg. Considering the injury concerns with Wall, Wizards could have used Landry Shamet, Aaron Holiday amongst others who were drafted after Brown. Mo Wagner, Lakers – Lebron James has played with just 4 first round rookies in his career (Luke Jackson, Shannon Brown, JJ Hickson, Norris Cole). Wagner is the 5th and given that the Lakers are 28-29 and fighting for their playoff lives, it’s clear that they could have done better, adding a shooter. Of course, they didn’t know James was coming at the time of the draft. But Wagner has played just 43 games and is averaged 4.8 ppg and 2.0 rpg in 10 mp. Anfernee Simons, Blazers – Simons is just 19 years old and super athletic, so he can certainly develop into a solid pick. He showed promise in the regular season finale, scoring 37 points. For the year, he played just 20 games, 7 minutes per game and 3.8 ppg (slightly skewed by that 37 point game). 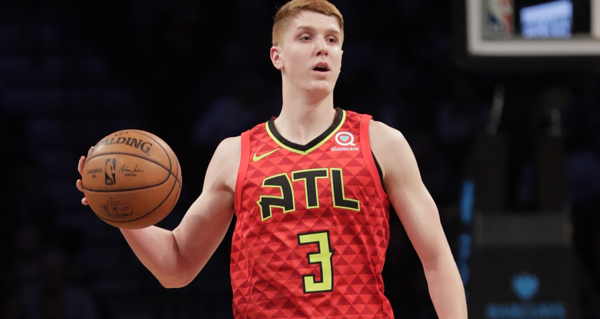 Kevin Huerter, Hawks – Huerter has become a valuable piece of the Hawks rebuild and a future part of an exciting young core. He started 59 games, averaging over 27 mpg and scoring 9.7 ppg. Huerter was picked at 19th, right outside the lottery. Mitchell Robinson, Knicks – One thing that hurt Robinson was the fact that he didn’t go to college in 2018. He fell to the second round, to pick #36 to the Knicks. His value came on defense, averaging 2.4 blocks per game (2nd in the NBA). He also scored 7.3 ppg and grabbed 6.4 rpg, playing 66 total games. Landry Shamet, Clippers – Shamet was the 6th PG draft and was taken 26th overall by Philly and was traded to the Clippers before the trade deadline as part of the package for Tobias Harris. Shamet scored 8.6 ppg, mostly off the bench in 20 mpg. He scored 10.9 ppg, starting 23 games for the playoff-bound Clippers. Rodions Kurucs, Nets – One of the most unknown players from the 2018 draft, Kurucs has been a big part of the Nets success and return to the playoffs. He has started 46 of the 63 games he played in, averaging 8.5 ppg, 3.9 rpg in 20 mpg. Gary Clark, Rockets and Allonzo Trier, Knicks – Technically these guys weren’t “under-drafted” because they weren’t drafted at all. Obviously, in hindsight, both men were among the 60 best players in the draft. Clark started strong but slowed down as the season progressed. He did play in 51 games and averaged 12 mpg, playing a valuable defensive role off the bench. Trier played 64 games for the Knicks, averaging 22 mpg, scoring 10.9 ppg, playing a key role for the rebuilding and tanking Knicks. Both men had their two-way undrafted contracts converted to full-time guaranteed deals.